We are on a roll with the freebies at QuickChek. My son was loving the last Free sub deal and I’m sure he’ll be heading there again to score the Free Zesty Pizza Angus Burger. I’ll have to print some out for my husband as well. Free lunches all around! Coupon is good until 2/22/10. 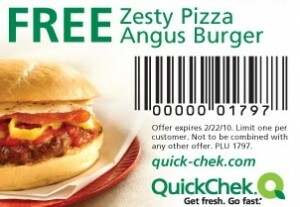 Don’t forget about the QuickChek free coffee coupon.